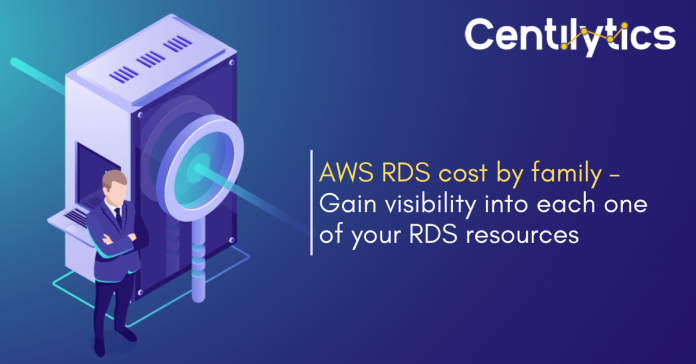 Home Visibility & Monitoring Cost Monitoring Why is it important to analyze AWS RDS cost by family? Neglecting your AWS RDS cost can probably cost you big-time especially when you are using its on-demand resources. Gaining visibility into their account certainly helps you to figure out what and where their cost is incurring from. Why visibility into your RDS resources is important for effective cloud management? RDS is a prominent service used widely which contributes a fair proportion to the user’s cloud spending. Any RDS line item could show up on your AWS bill and it can become a tedious task to understand what exactly is driving all that spending. Centilytics provides various insights which give monitoring capabilities to your cloud infrastructure. Besides, for user’s convenience, the cloud management platform provides smart visualizations such as tables, graphs, pie charts etc. This helps users to easily interpret their cloud cost. 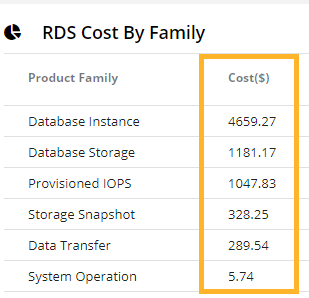 One such useful insight is AWS RDS Cost by family. 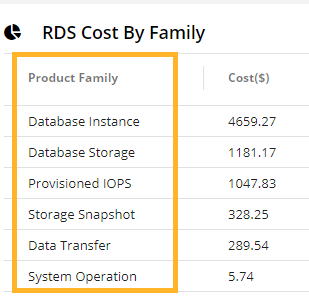 RDS Cost by family categorizes your numerous RDS related resources currently running in your cloud infrastructure under families and shows the cost corresponding to them. Users can easily interpret their AWS RDS cost by family leveraging tabular representation or graphical (pie-chart) representation or both. Product Family: This column displays the RDS product family. Product family shows the cost distribution of your total cost spent on RDS related resources. You can sort this column in ascending and descending order according to the cost with just a single click. Cost: This column displays the cost (in dollars) corresponding to the product family. Your AWS RDS cost by family can be sorted in ascending and descending order with a just single click. Resource Tags Value Applying resource tags value filter will display data which will have the selected resource tag value. For e.g. – If the user has tagged some resource by a tag named environment has a value say production (environment: production). Therefore, the user will be able to view data of all the resources which are tagged as “environment:production”. The user can use the tag value filter only when a tag name has been provided.